Back in november, I hosted a talk at SoftShake. Like mentioned in my feedback post, I included some live-coding during the session. For the record, I’d like to share the set of tools I used to be comfortable doing this Robot Framework live-coding on my Mac. 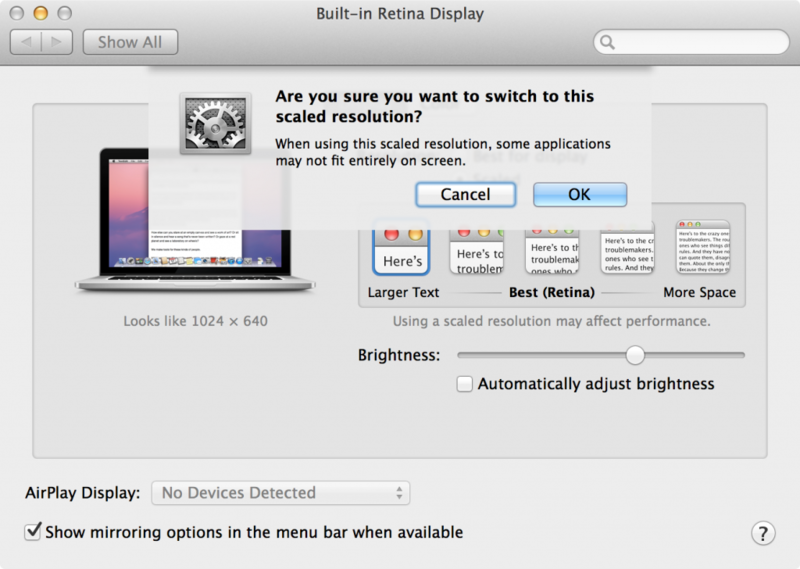 1) Screen resolution: once plugged to the projector, the resolution available suddenly become very low. So it is important to rehearse the session using this low resolution, otherwise it will be very disturbing on the actual day. Choosing the largest display in Preference should get a resolution close to the projector if we don’t have access to one. 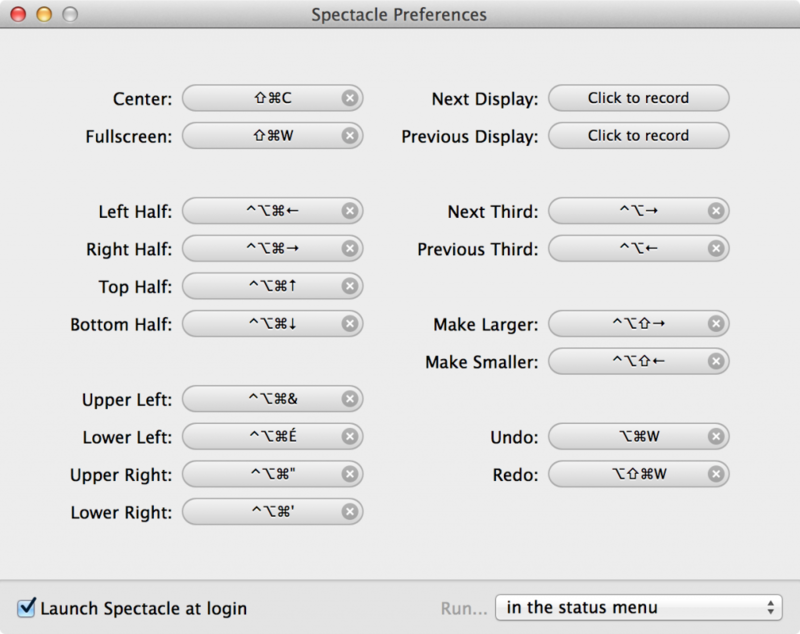 2) Window manager: I use Spectacle to quickly change windows arrangement setup. There are keyboard shortcuts to display windows on full, half or quarter of the screen. Once you get used to it, you can very quickly set 4 different windows in a couple of seconds on the screen. 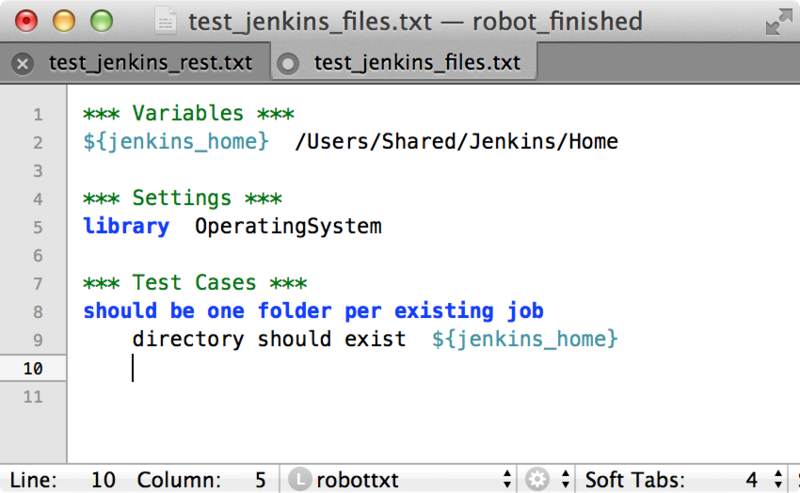 3) Terminal : I use iTerm2. 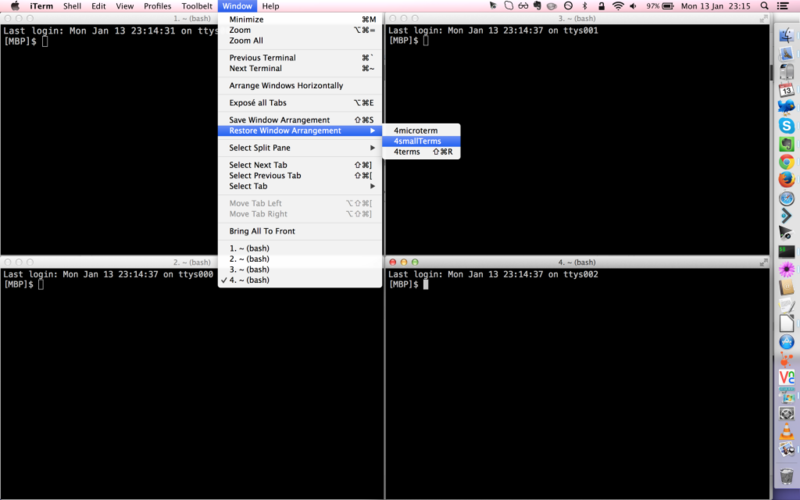 In order to quickly get 4 small shell windows, I place them on the screen using Spectacle and save the window arrangement in iTerm2. Then I can associate a keyboard shortcut to this arrangement to get it very quickly during the presentation. 5) Live execution of the test. I wanted to obtain an effect similar to infinitest plugin with which each time a change is made on the source code, Infinitest runs the tests in the IDE. So I installed fswatch to run a script every time a directory content would be modified (i.e. every time my test would be updated) and created a small launch_robot.sh script that would be launch in such an event (script does clear + launch Robot). 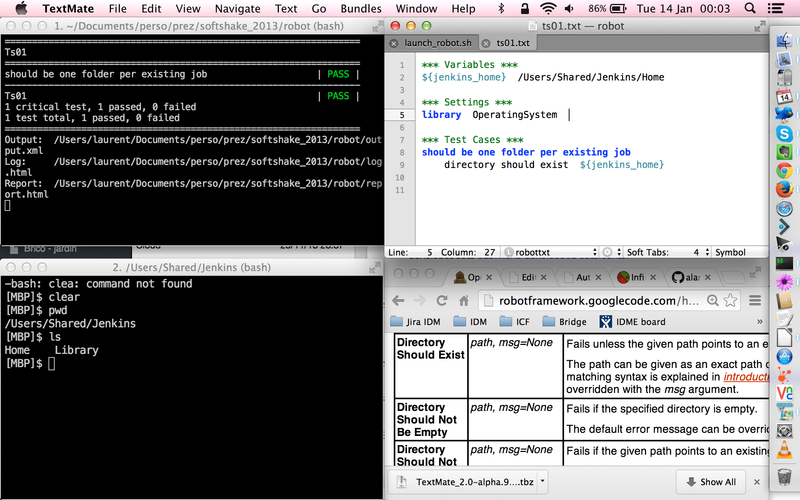 4) bottom-right: web browser with Robot Framework Library documentations to show the keywords I used in my code. During the session, the test regularly went from green to red when I added a not-yet-created keyword or used a keyword in a library I forgot to import. So the idea was to save the file as often as possible to see the result change color at the same time. This could even be performed by 2 people: one QA and one dev… Will see if I ever try this! Last week I went to Agile Grenoble Conference. The whole day was of very good quality. I was lucky with my choice of sessions and shared my day between good discussions and great talks. All of them were very interesting but I was really bluffed by Sandro’s performance. And this was also very motivating to become more fluent with an IDE as part of the performance was the advanced usage of Eclipse, which for a Java developer is a real add-on. Before the keynote of the afternoon, organizers found a great way to read the whole 12 principles of the Agile manifesto to the full audience of the conference. Strangely enough, I think it was the first time I heard the 12 principles read totally during the conference after 5 editions. The idea was that every person in the room had received a cup with 3 sentences from the manifesto. When our sentences were read, we got to sit. After the 12, a group of 10 people remained standing and they had to go on stage to read the sentence they had on their cup. Those were fake sentences like “company result is the primary measure of progress”. Very clever game! This year I was a full visitor: I was neither organizing nor presenting. So thanks to all the contributors of this great day and I hope to give a help one way or another next year!